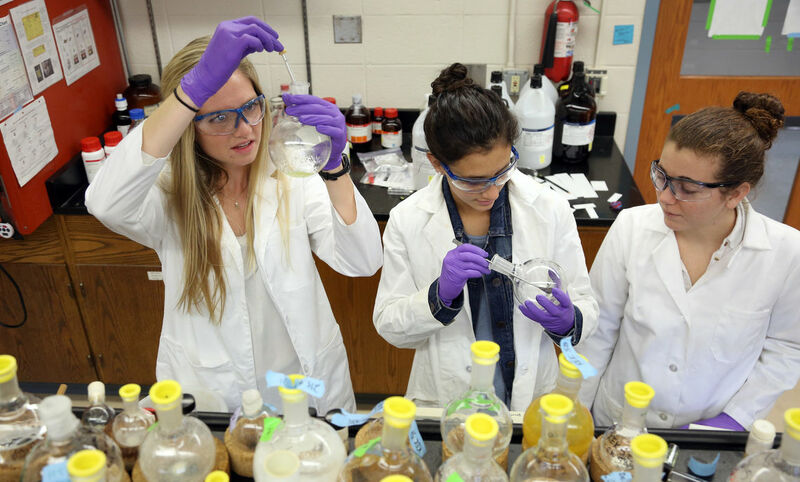 A chemistry professor and his students at Franklin & Marshall College are working on producing a molecule to treat a rare, but devastating genetic disorder that’s fatal in children before they reach their first decade of life. The disorder is caused by a missing enzyme needed to produce the molecule GM3, a ganglioside critical to a child’s neurological development, said Professor of Chemistry Kenneth Hess. Hess, along with Ed Fenlon and Scott Brewer, F&M professor and associate professor of chemistry, respectively, are working with the Clinic for Special Children in Strasburg, Pa., which specializes in researching and treating children with genetic disorders. "The Clinic’s really been on the forefront of integrating genetic research into primary care," Hess said. "That's been beneficial for our students to see how they practice medicine." While children with the disorder are born with GM3 in their system, which helps keep children healthy, those gangliosides last a limited time. “Since they don’t have the enzyme to replace GM3, they start to show detrimental effects within three months,” Hess said. “In a year’s time, they have epileptic seizures, they’re deaf and blind. There’s no evidence they can communicate. They're just a shell because they're missing this enzyme that makes this molecule." The Clinic tried several ways to provide GM3 for children with the disorder. It considered extracting GM3 from bovine buttermilk, but the complex process and needed quantities made it cost-prohibitive. It tried feeding the children GM3-rich pig brains, but that was ineffective. "The challenge is we don’t have enough of this stuff to do fundamental biological studies or at least not a stable supply. It’s very expensive, and commercially available GM3 doesn't exactly match human GM3," Hess said. The F&M researcher and his students turned to science in an attempt to make the molecule using various chemicals. Last year, they were successful in making GM3 cost-effectively in an F&M laboratory. Hess and his three students – junior Crystal Good, sophomore Kate Meyers and senior Katherine Kistler – have made about 150 milligrams of GM3, but only a gram or two is needed for the first study. The students found the experience rewarding. Meyers, who with the other two students worked with Hess over the summer, said she found her academic passion and intends to declare chemistry as her major in the spring and pursue the field in graduate school.